"Joel ... this is your dad. Yeah ... I just wanted to see if this phone is working. You think it is?" "I need some socks. I don't like nylon, I like black." "I got a lot of paperwork in that drawer but there are no pants." "Some biscuits are wonderful ... like Red Lobster." "You know ... people walk back and forth here. I don't know what they do." "Joel ... what do you do? Do you have a commercial life?" Congratulations! What a beautiful couple. 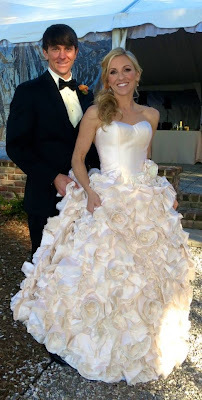 Nicole's dress is divine! Love that Sammy is still kickin'. God bless him! Love you too Jenn. Great seeing you guys in LA.